Patches that appear lighter or darker than the surrounding skin on your neck are usually not a sign of a serious medical problem but can be cosmetically frustrating. This type of skin discoloration is known as hyperpigmentation or hypopigmentation and can be caused by a number of factors, including genetics, medication and sun exposure. The skin covering your neck is thinner than your facial skin and more vulnerable to damage from the sun and aging. Learn what may be causing unsightly blotches and how to treat and protect the delicate skin below the chin. Hyperpigmentation refers to skin discoloration that occurs because of excess melanin production. Melanin is responsible for providing your skin with its natural color. When melanin production increases on certain areas of your neck, the result is darkened skin tone that sharply contrasts with your normal complexion. According to the New Zealand Dermatological Society, the texture of your neck skin is also apt to change as discoloration sets in. Hypopigmentation refers to a decrease in melanin production, providing the exact opposite of hyperpigmentation. In short, you are left with lighter blotches on your neck that also are a sharp contrast to your natural skin tone. Hypopigmentation is more prominent in those with darker skin tones such as African Americans, Native Americans and those of Latin descent. Hypopigmentation, also referred to as depigmentation, occurs in localized areas such as the back of your neck and face. The causes of blotch formation can be attributed to genetic factors, sun damage and general aging. Photoaging is a condition that occurs when years of damaging UVB ray exposure injure the deeper layers of your skin, according to the New Zealand Dermatological Society. This forms blotches known as age spots or liver spots to form on your neck over the course of your life. Lighter pigmentation may be a condition known as vitiligo. According to University of Maryland Medical Center, vitiligo has no known cause, however scientists believe that genetics may play a major role in depigmentation. Darker blotches on your neck can be treated effectively through the use of fade creams containing hydroquinine. These creams break down the excess melanin, restoring natural skin tone. Procedures such as chemical peels and laser skin rejuvenation that are performed in-office by a licensed dermatologist have also showed promise in correcting darker pigmentation problems on the back of the neck, according to the New Zealand Dermatological Society. Lighter skin blotches are best treated with corticosteroid creams early into the disorder. Other treatments include protecting your skin with sunscreen and using concealers to even out your skin daily. Protection is the key to helping your skin heal as well as prevent further discoloration from occurring. According to the American Academy of Dermatology, year-round sunscreen application is recommended to stop the sun's rays from damaging the deeper layers of skin. Protective clothing such as high-necked shirts, scarves and hats provide shade to your neck, blocking harsh winds and UVB rays as well. 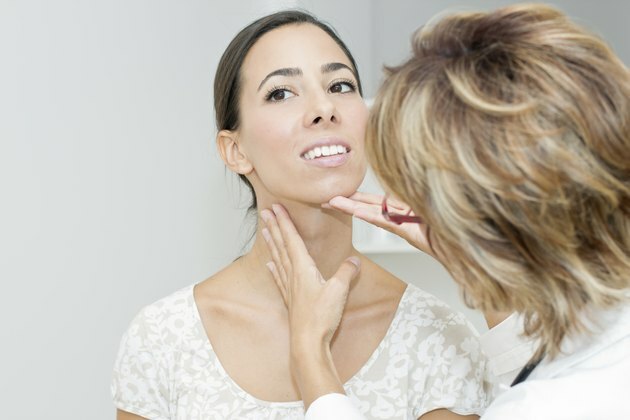 Another preventative measure that will help you determine any skin changes is yearly examination of your neck. Look for new patches of discoloration as well as growths and odd-shaped spots.